There are some foods that almost everyone seems to love and ice-cream is one of them. I’ve actually never met anyone who didn’t enjoy a sweet, frozen treat! I can totally relate, ice-cream is one of the best food inventions. Ever. This triple berry banana nice cream with coconut milk is a healthy plant-based dessert that tastes amazing. When I was a little girl, I stayed with my dear grandmother for a few weeks every summer. She lived overseas and we didn’t see each other as often as we’d like to, so when we did, we really enjoyed our time together. We both shared an enormous love for ice-cream. Every day when we went to town, she bought us an ice-cream cone. One never seemed enough though, especially during those hot summer days. My grandma said that one has to enjoy life, which resulted in us snacking on 2 and sometimes even 3 ice cream cones throughout the day. I know! With a more balanced lifestyle nowadays, I can’t imagine myself eating that much or that kind of ice-cream with all the sugar, milk and additives. I was thrilled to discover that you can easily make your own healthy ice-cream full with wholesome ingredients. The base is made from frozen bananas and you can add any kind of fruit to it. Nice cream is dairy-free, vegan, raw and you can make it entirely sugar-free, because the frozen bananas are sweet by themselves, especially when they are very ripe. 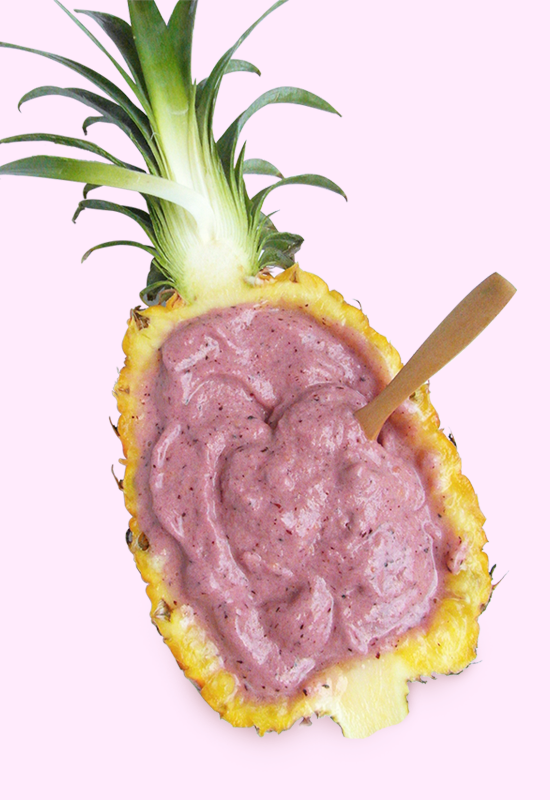 This berry banana nice cream with coconut milk makes a perfect healthy, delicious treat! Use very ripe bananas that you cut in small chunks and store them in containers in your freezer. Fruit that has been frozen for 12+ hours results in the best taste and texture for both nice cream and smoothies. I always have different kinds of fruit in my freezer. It keeps long and it’s a great way to have your own seasonal produce year round. Blend the frozen banana until you get an ice-creamy consistency. You might have to add some water, but keep the amounts small, about 1 tablespoon should be enough. You don’t want it to become anything near liquid, just to get the blender going. Add the berries and mix again. Add the coconut milk for extra creaminess. It also provides healthy fats and helps with vitamin absorption. 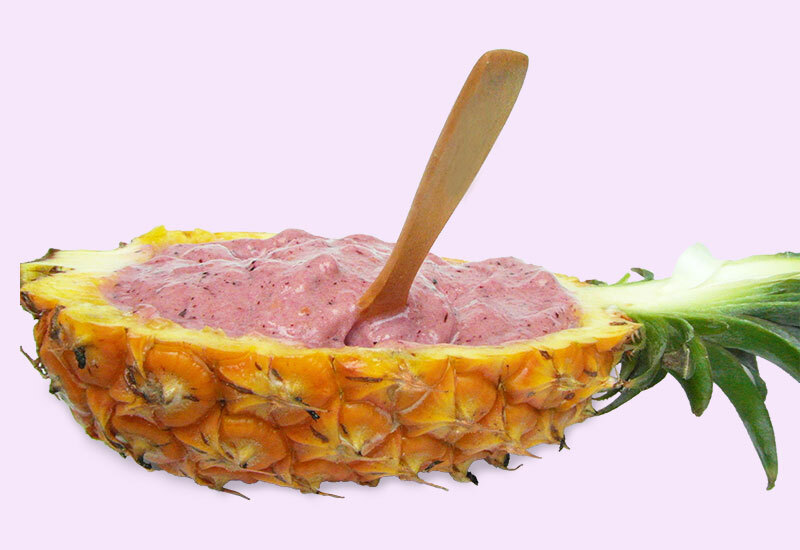 Serve this funky berry banana nice cream with coconut milk in style! Cut a pineapple in two halves and scoop out the pineapple fruit. Use the pineapple as a bowl to serve the nice cream in. If you’re not going to eat it immediately, put the pineapple half in the freezer for half an hour prior to serving the nice cream. This way it won’t melt so fast. You can top the berry banana nice cream with fruit, nuts, raw chocolate, shredded coconut, cacao nibs etc. Or just keep it minimalistic and enjoy the pure flavors! This looks really AMAZING! No sugar at all in this recipe? I have to try this! No added sugar at all! 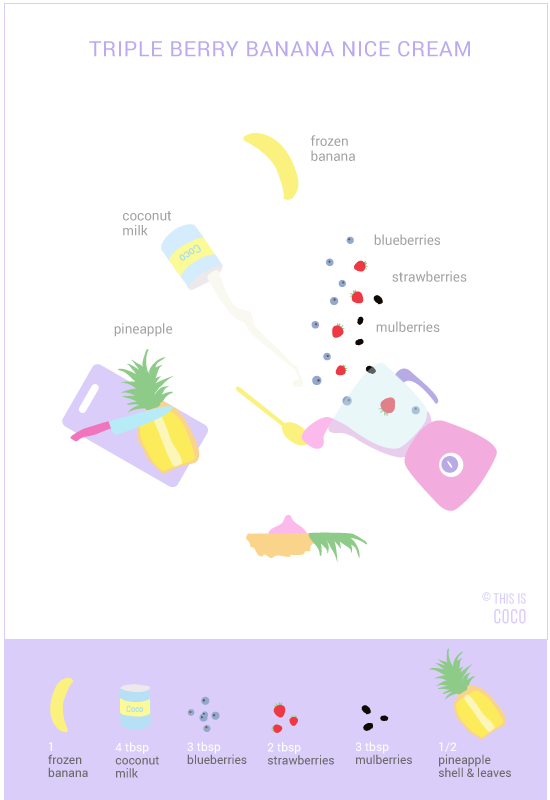 It’s naturally sweet because of the fruit, which gets even sweeter when you freeze and blend it.